Butterflies thrive in sunny gardens where the wind doesn’t blow. Windy hills do not make good butterfly habitat. Quiet, sunny, low-lying meadows with some stones and mud pockets are ideal. If stiff breezes blow through your garden and you want to invite butterflies to visit, now is the time to plant a windscreen. Afterward, add the flowers and plants that keep the adults in the garden. Windscreens are made up of heavily branched shrubs and evergreen trees whose branches sweep the ground. Add trees to the perimeter that provide caterpillar food as well as cut down on cross currents. Butterflies also need safe places to deposit their eggs, where their young can grow and thrive. For instance, the silver-spotted skipper (Epargyreus clarus) and clouded sulphur (Colias philodice) feed on black locust trees (Robinia pseudoacacia). 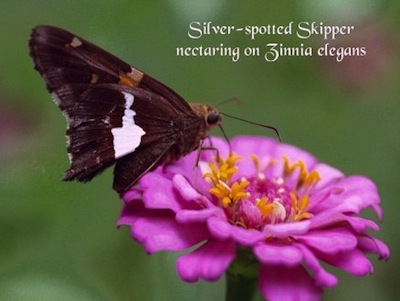 North Carolina State University has an in-depth chart¹ of butterfly host trees and shrubs along with the zones and habitats in which they will flourish. Well positioned vines on fences also can be used to cut down on wind flow. Wisteria (our native Wisteria frutescens) and American hops (Humulus lupulus) both feed butterfly larvae. Mourning cloak (Nymphalis antiopa) butterflies lay their eggs on willow, aspen, cottonwood, and elm. Sycamores and willows play host to tiger swallowtail butterflies. Viceroys utilize willow, poplar, and apple trees. The black swallowtail prefers the herb garden where the eggs can hatch and devour dill, fennel, and parsley. Vegetable gardens are no strangers to butterfly larvae either. 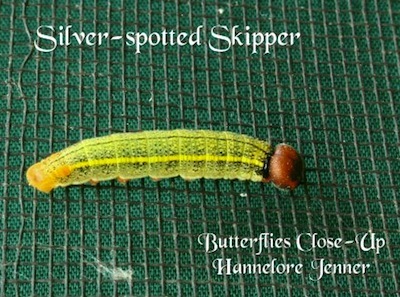 Many beans play host to caterpillars, such as the skippers. They wrap themselves in leaves, held together by strings of silk. These butterflies, up until now, are generalists to some extent. They will feed and thrive on several different plants. Monarch butterflies (Danaus plexippus) and Gulf fritillary (Agraulis vanillae) are the specialists. 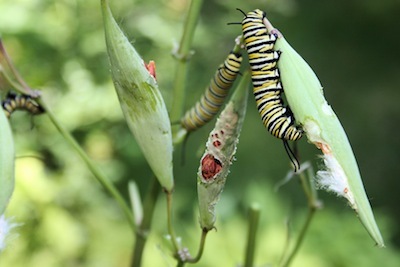 Monarch caterpillars will feed on only one family of plants, the milkweeds (Asclepias). Gulf fritillary are passionflower feeders. These are the only plants that sustain them. There are many types of asclepias growing throughout the U.S. In your area, you might be able to grow one or more of these milkweeds: Common milkweed (Asclepias syriaca) and (Asclepias tuberosa), tropical milkweed (Asclepias curassavica) often grown as an annual, and swamp milkweed (Asclepias incarnata). As far as the passionflower, or Maypop as it is sometimes called (Passiflora incarnata), is concerned, grow it carefully. It can become invasive in some areas of the country, even though it is a native vine. Remember to build your butterfly habitat in a sunny area, free from wind and pesticides. Native trees, shrubs, and flowers are the best hosts for your visitors. If you just plant flowers, you will have some butterflies. If you provide food for their young, butterflies will dance in your garden, filling it with airy beauty.